“Let those flowers fall tonight,” cousin of the honoree and Master of Ceremony of the evening, Mr. Neil Blyden declared as congratulatory praises were heaped on outstanding and erudite member of the BVI legal profession Dr. Benedicta Samuels-Richardson, whose recent doctoral achievement was lavishly and fittingly celebrated at a reception. The great event was held at the Sky-World Restaurant on 20 October, and featured deserving kudos for Dr. Samuels-Richardson who after years of hard work and endurance of various setbacks was finally rewarded when she became Doctor of Philosophy of Law. The journey to her PHD was described an epic one beset with challenges and delays. Most challenging was the fact that Dr. Samuels-Richardson sometimes had to wait for months for feedback on her work. During the reception, she was not only congratulated on her doctorate, but also for her detailed research that is a worthwhile contribution and reference in marriage and dissolution cases. Her work particularly deals with inherited and gifted land as well as nontraditional unions. In an interview with The Island Sun newspaper Dr. Samuels-Richardson explained that her quest for a deeper appreciation of the law influenced her academic achievement. 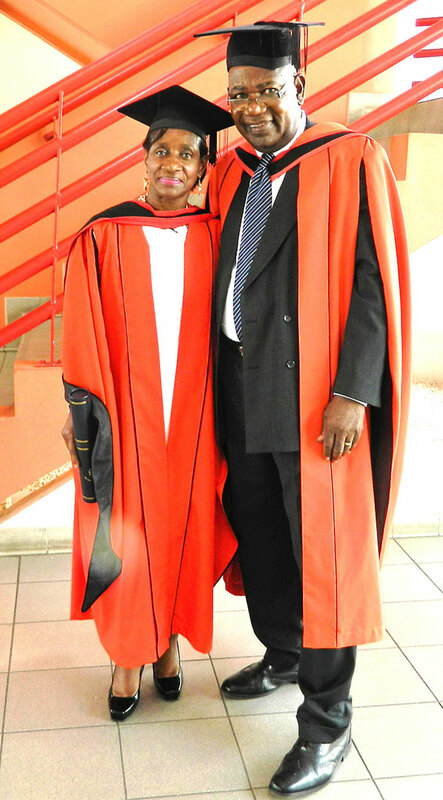 She said that she was especially concerned with land matters in the Territory and explained that the completion of her Master’s Degree in Law served as a catalyst for the exploration of some interesting questions of rights to land. The most prominent of Dr. Samuels-Richardson’s concern was the issue of dividing matrimonial property upon the breakdown of a marriage as she noted that this matter pervades societies that are much more developed than the BVI. “Many of those countries still grapple to formulate a fair solution to the vexing issue of splitting matrimonial assets,” she noted. “Given my legal background and experience, I decided to focus my Ph. D. research on the division of matrimonial real property in the Virgin Islands. I was able to begin my research under the auspices of the United Nations Educational Scientific and Cultural Organization (UNESCO) and with some concessions from other sources,” she said. Getting the information needed for her research proved to be a daunting task as Dr. Samuels-Richardson explained that the process involved, among other things, the compilation of data from a variety of sources, visits to a number of libraries, and the study of the laws of a host of other jurisdictions. Additionally, the research required exposure to a collection of local, regional and international cases, as well as an array of journals, articles, and doctrinal and practitioners’ text. She acknowledged a number of local authors – including Dr. Patricia Turnbull in “Can These Stones Talk”; Dr. Michael O’Neal in “Slavery, Smallholding and Tourism”; and of course – Mr Vernon Pickering’s volume “Early History of the British Virgin Islands.” all of which she said provided a reservoir of knowledge relating to land and land ownership in the Virgin Islands. “The research spawned some years, but I was eventually able to complete the project,” Dr. Samuels-Richardson disclosed. In the final stretch, she shared that before submitting the finished opus, she was required to subject her thesis to electronic scrutiny by running it through a program designated by the University. She noted that the Library conducted a further check on citations before she presented her thesis for examination. “Although she had attended other candidates’ oral examination, I found my viva a grueling and demanding experience,” she disclosed. “First, there is the debate as to what constitutes a marriage. The legal definition in Hyde v Hyde speaks of a relationship between one man and one woman to the exclusion of all others. This is what our Marriage Act contemplates and that is the conservative view. However, given the way in which our society has developed, that institution of marriage has been the subject of challenge. This challenge manifests itself – to some extent – in the social acceptance of other forms of non-traditional and informal relations such as unions other than marriages,” she explained. Dr. Samuels-Richardson noted that legislations such as the Pensions Act and the Social Security Act tacitly endorse other forms of relationships other than marriages. “Second, research shows that a high percentage of marriages terminate in divorce. The question is: what should happen to the marital acquests upon the breakdown of that marriage? Do Matrimonial Proceedings and Property Act and the Rules provide the answers?” she asked. She said that her thesis touches on the issue of persons within BVI society losing property which they inherited – family land – gifted land – or even property which they owned before the marriage was solemnized. Dr. Samuels-Richardson suggested that laws be enacted to sequester those categories of property from the marital estate, subject, of course, to certain conditions. Deputy Premier (at the time Acting Premier) and Minister for Natural Resources and Labour, Dr. the Hon. Kedrick Pickering in his special remarks at the event described the honoree as a phenomenal success. “Any way you twist it, it will add up to the same thing she is amazing,” Hon. Pickering said. Former BVI Attorney General and distinguished lawyer Mr. Lewis Hunte, QC told the gathering that Dr. Samuels-Richardson is blessed with a very determined spirit, which got her where she is: “Benedicta is a perfectionist, and nothing but the best would satisfy her… When Benedicta was accepted to practice, I was honored to present her at the Bar. Her parents were elated, and I am sad that none of them are here now that she has scaled Mount Everest,” he said. Mr. Richard Parsons who Dr. Samuels-Richardson’s worked for as a secretary back 1980s and is credited as one of the persons who influenced her legal journey spoke at the reception. He told the gathering: “Benedicta always wanted to have an input. Although she said I influenced her love of the law, I think there was a little lawyer inside waiting to get out all of the time. I think she always – from the very beginning – wanted to be lawyer. I think in the end I only gave her the opportunity to express her love of the law.” In relations to her doctoral achievement he pointed out that she heads a successful law firm, and he cannot imagine how she did it all. Longtime friend, noted Lawyer Astra Penn shared that she and Benedicta met at Law School at the University of the West Indies Cave Hill campus. She shared fond memories and expressed felicitations to her friend on her academic achievement. “As you continue on your journey I ask that you continue being the great person that you are. Your journey to this point had been long and not without its unscheduled delays,” Ms. Penn stated. Dr. Lydia Pickering, who was Dr. Samuels-Richardson’s secretarial teacher, said that although some of the credit for the success is given to her, she can’t take much of it: “Benedicta came to me with good communications skills, good written, and oral skills. Benedicta has been an exceptional student, and today she is an exceptional professional,” she said. Her brother Sonny Samuel told the gathering: “We all prayed during her sickness that this day will be a reality. Our parents are not here but thank God all of us are here”. “A doctoral degree is not an easy task…Congratulations my phenomenal cousin may God continue to guide your path,” Jeanette Scatliffe-Boynes said. There were cheers as Dr. Samuels-Richardson’s daughter Odette, and Grandson Shay congratulated her and gave a brief family perspective of the journey. Similarly, Professor Emeritus Arthur Richardson, spouse of Dr. Samuels shared that his wife experienced various setbacks including two change in PhD supervisors during her journey. As a Professor, he explained the arduous PhD process, and stressed that Dr. Samuels-Richardson’s task was to create new knowledge in law. “I have to commend Benedicta for the fact that she stayed the course. I want to commend her that she maintained that focus,” he declared.